More than 40 percent of parents with youth-athletes between the ages of 10-17 feel that any qualified health-care provider can provide a sports physical, according to a University of Michigan C.S. Mott Children's Hospital National Poll on Children's Health released on Monday. 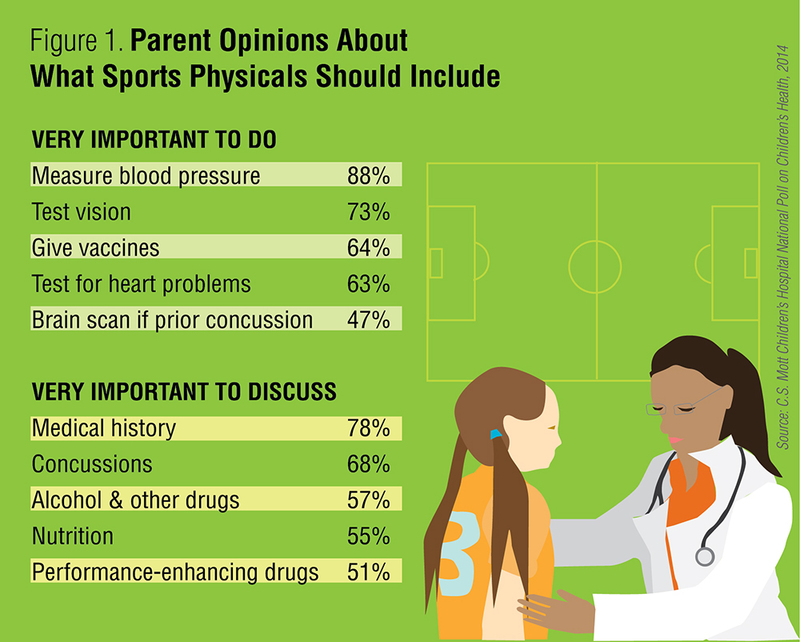 The poll surveyed 434 parents with youth-athletes in that age range, asking questions regarding their children's sports physicals. Parents had to rate the importance of health-care providers discussing information such as a child's medical history, nutrition, and concussions, and also weighed in on the importance of certain medical procedures, such as vision tests and blood-pressure measurements. Seventy-four percent of parents reported taking their child to their usual health-care provider for their physicals, with 11 percent going to a walk-in or urgent-care clinic, 11 percent at school, and 4 percent "other." Eighty-nine percent said sports physicals are not an adequate substitute for a routine check-up with a physician. In terms of what physicals should include, parents placed the highest priority on measuring blood pressure (88 percent), testing vision (73 percent), giving vaccines (64 percent), and testing for heart problems (63 percent). Only 47 percent of parents thought health-care providers should give youth-athletes a brain scan if they had previously suffered a concussion. "Parents differ in their views of sports physicals," said Sarah J. Clark, associate director of the National Poll on Children's Health, in a statement. "One view is that sports physicals are a 'check the box' requirement for generally healthy kids, so they can be done by any health-care provider, with convenience being a key factor. "Another view is that sports physicals should be very in-depth, even including diagnostic tests such as an EKG or echocardiogram to check for underlying heart conditions in kids without symptoms," Clark continued. "But parents may not realize that most primary-care offices may not have the technology for those types of tests." Seventy-eight percent of parents considered it "very important" for health-care providers to discuss medical history, with concussions (68 percent), alcohol and other drugs (57 percent), nutrition (55 percent), and performance-enhancing drugs (51 percent) following.